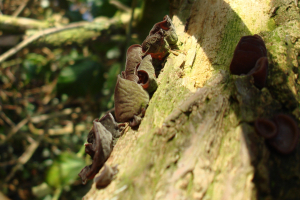 Observation - Auricularia auricula-judae - UK and Ireland. Description: Wrinkly ear-like purple/brown flaps found on dead wood. Also some fresher more purple cups. Wrinkly ear-like purple/brown flaps found on dead wood. Also some fresher more purple cups.